As a lifelong geology buff and avid traveler, I have no shortage of favorite rock formations: the epic red sandstone towers of Fisher Towers, Utah, the wild gneissic folds at Maine’s Pemaquid Point and of course, the massive quartzite fin of Seneca Rocks, West Virginia, to name a few. 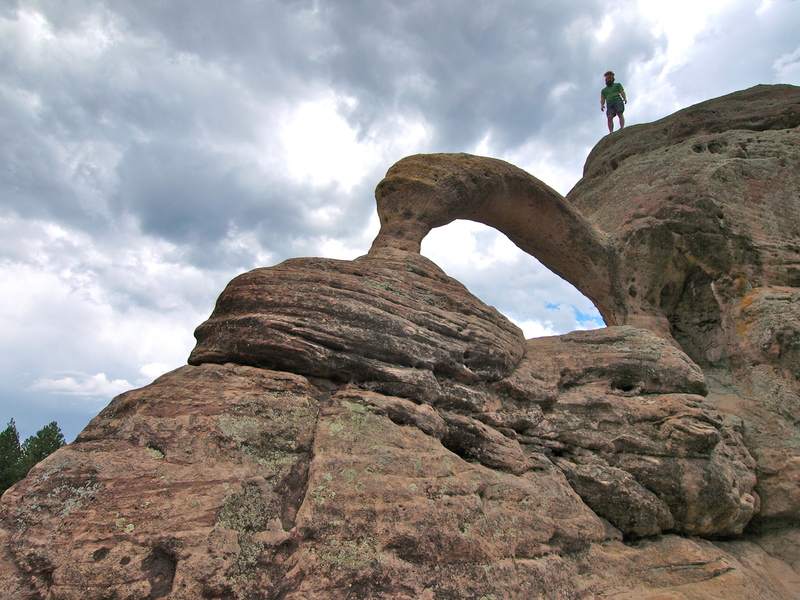 But when it comes to single rocks, my all time favorite might be Tea Kettle Rock near Coyote, New Mexico. Tea Kettle rock sits all by its large lonesome in a field off Forest Road 103 in the Jemez Mountains 24 miles southwest of Coyote, New Mexico. You won’t find it on many maps. I found it the old fashioned way: by driving down a long, rough dirt road until I found something cool to stop and see. 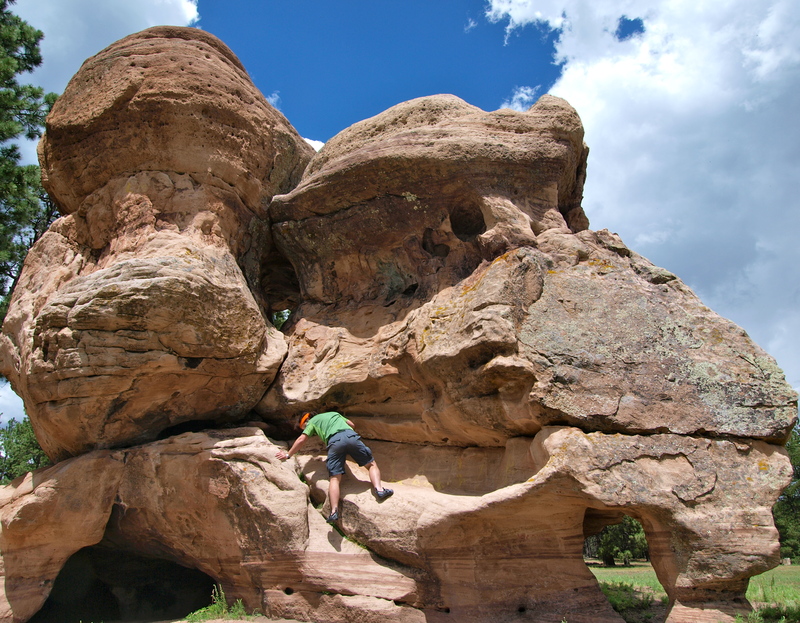 Most of the rock formations in the Jemez Mountains, including the famous cliff cave dwellings at Bandlier National Monument, are volcanic tuff ejected from a series of eruptions by the Valles Caldera supervolcano around a million years ago. Tea Kettle Rock, however, is sandstone from the El Cobre Canyon formation of the Cutler Group, laid down around 300 million years ago when this region of the world was inundated by an inland shallow sea. My boyfriend Drew brought his climbing shoes all the way from California last week with Tea Kettle Rock in mind. Every surface of the Tea Kettle has been weathered and sculpted into ripples and pockets that make perfect handholds. The sandstone sections of this rock are fairly robust and good for climbing, but the limestone-pebble conglomerate parts can be quite crumbly and less than ideal. Even so, Drew made it all the way to the summit of Tea Kettle and back down again with only a few minor scratches. 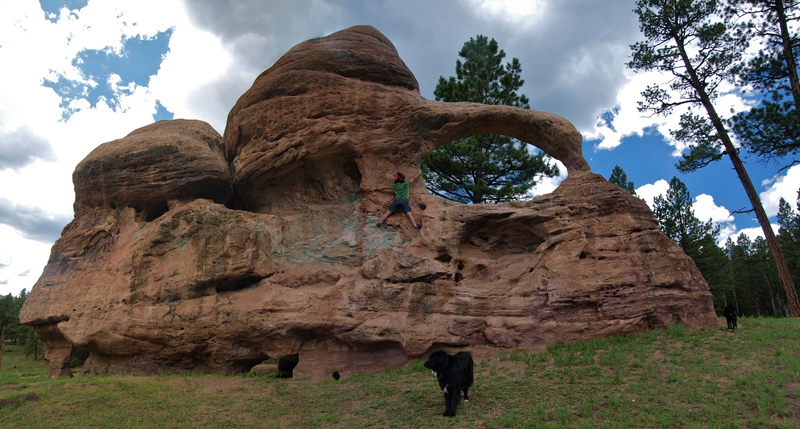 Tea Kettle is named for its distinctive arch, which spans 12 feet and is formed from a fairly solid fin of reddish sandstone. Rockfall doesn’t seem to have played a role in the formation of the arch as there are no boulders or shards lying on the ground. Instead it’s likely it formed over millions of years of gradual weathering. This arch is old and likely to last for a long time to come: its shape is very nearly a caternary parabola, an ideally stable mathematical curve used in building strong, long-lived archways in cathedrals, bridges and other stone constructions. In addition to the large arch, Tea Kettle also boasts a number of smaller archways and holes as well as a small cave. 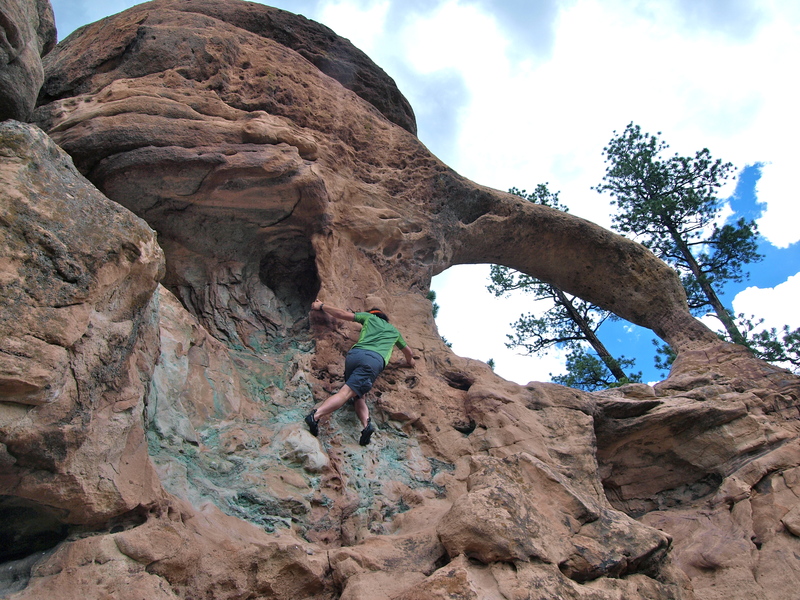 The lack of chalked-up holds indicates that rock climbers haven’t really discovered the Tea Kettle, which lies pretty far off New Mexico’s often faint beaten paths. Some minor vandalism has scarred the surface, but it won’t last long in the grand scheme of things. 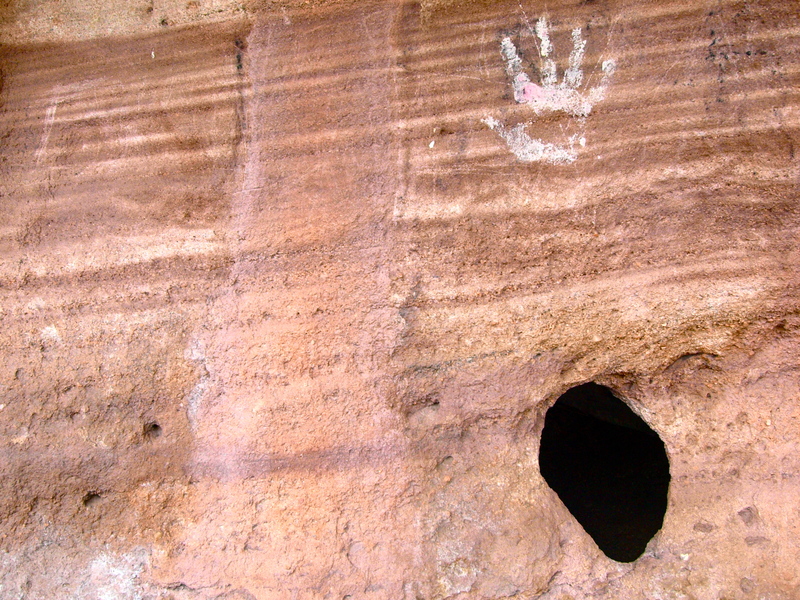 The only graffiti that might be interestingly old is a single white handprint that has persisted unchanged over the handful of years that I have been visiting this rock. Who knows who made it or when, but I hope it lasts a long time. This entry was posted in Bowie & D.O.G., Hiking!, New Mexico, Photography, Road tripping! 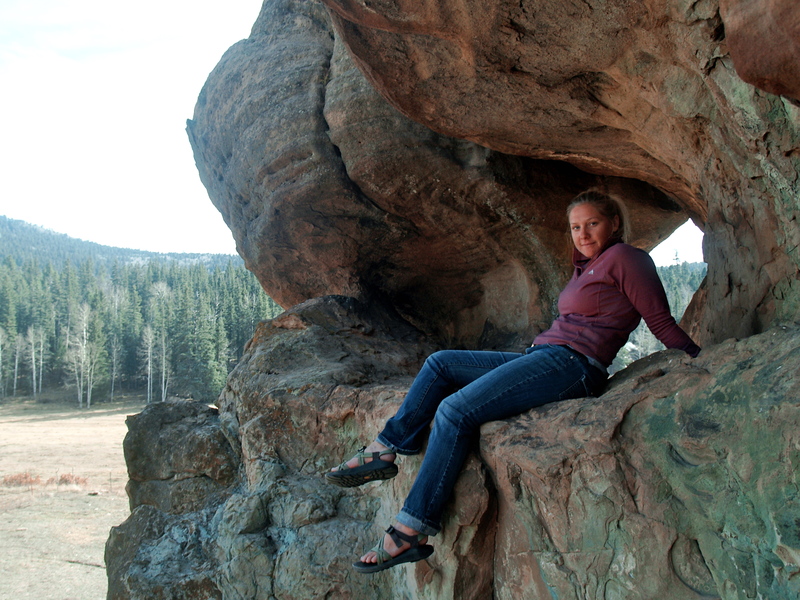 and tagged arch, bouldering, Coyote, fin, Jemez Mountains, New Mexico, rock climbing, sandstone, tea kettle rock. Bookmark the permalink. Mary, very nice article on the Tea Kettle in The Jamez.